Whether you are seeking to become a permanent resident or just planning on visiting Houston, you will have to cross a border or pass through a port of entry if you are coming from another country. The border and ports of entry have very high security, and a critical decision will be made of whether or not you will be permitted to cross or enter. It’s very important that you be prepared for that decision. If you are unprepared for any element of border crossing, you could be detained. If you are supposed to be starting a new job, you may have to inform your new employer that you are in a detention center and unable to report to work. Depending on your circumstances, you could even wind up in a detention center for a long time. If you are refused entry into the U.S., or deported at the airport (called an “Expedited Removal”), your options for returning to the United States in the future may be limited. If you are planning entering the U.S., whether crossing a land border or flying and passing through a port of entry at an airport, it’s very important to be prepared for any and all issues that might arise. 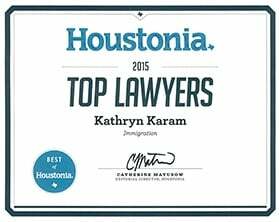 Houston immigration lawyer Kathryn Karam can assist you in preparing for this sometimes risky endeavor by reviewing potential problems, and representing you if you are in need of legal assistance. Kathryn Karam finds innovative solutions to difficult problems. If you are planning on entering the country or if you have problems when attempting to enter, she can assist you in finding the best way forward. Call Karam Immigration Law today at (832) 582-0620 to set up a consultation to discuss your entry. Kathryn Karam works with people entering the country in Houston, including at the Port of Houston and Bush Intercontinental Airport, and those seeking to come to the Houston area. The federal agency charged with enforcing laws pertaining to who should be allowed into the country and with what is the U.S. Customers and Border Protection (CBP). CBP falls under the umbrella of the U.S. Department of Homeland Security. CBP is charged with evaluating every person entering the United States for whether they pose a threat, particularly if they pose any risk of being a terrorist. They can also search anything that any person attempts to bring with them into the United States. Contraband can include drugs, weapons, large amounts of cash or anything regulated by treaty, including endangered animals and endangered animal products, like ivory. If they find any contraband on your person or in your luggage, they will suspect you of trafficking, and you will likely be detained. Any criminal conviction, including ones that are minor and/or far in the past, can result in your being refused entry into the United States or detained. You must declare your criminal history upon entry. Failure to disclose anything on your record could result in you being permanently barred from legally entering the United States. Not every conviction will result in your being denied entry. However, an attorney can assist you with determining what a likely outcome will be. If you have an offense on your record that would prevent you from legally entering the United States, a lawyer may be able to help you obtain a waiver of ineligibility. The process can take months, so it’s important to start it as soon as possible. If you have a criminal issue in your past, Houston Immigration Attorney Kathryn Karam can advise you on whether you will be permitted to reenter the U.S., if you are at risk of being detained, and what action you may be able to take. If you pass through a border checkpoint (even if you are not asked any questions and do not provide any documentation of your identity) this is considered a lawful admission to the United States. In some cases, a person seeking permanent residence may be required to prove he or she lawfully entered the United States. Recent court decisions have opened up the possibility of arguing that you lawfully entered the United States, even if you do not have an I-94 admission record and had no authorization to enter the United States. If you need assistance proving that you entered the United States legally, an attorney can assist you. The Office of Biometric Identity Management (OBIM), also under the umbrella of the DHS, collects information on suspected and known terrorists, including fingerprints, photos and other physical information. Any person attempting to enter the country will have their information run against a database. If you have any reason to believe that this will trigger an alert, it’s important to straighten the matter out before you get to the border. An attorney can assist you.